Let's see--we have boating, fishing, swimming, golfing--and what else? There's such a variety of things to keep you entertained while you're in the West Michigan area! 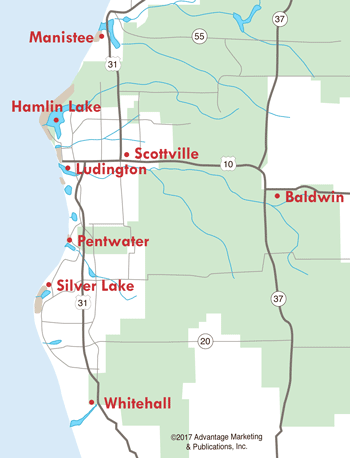 Tour Historic White Pine Village or enjoy a thrilling dune ride at the Silver Lake Sand Dunes, or visit the popular Ludington State Park. Take the family out for a game of mini-golf, bowling, or catch a concert. You can't leave the area without visiting one of the spectacular lighthouses of the region, and just catching the sunset over Lake Michigan is worth the trip. View the S.S. Badger carferry as it sails into or out of Ludington, or hop on board yourself for the four-hour trip across the big lake. Boredom is never a problem here in West Michigan! Here you'll find a play area, basketball court, and Mucha Field, a full size little league baseball field. Permanent exhibits at the Manistee County Historical museum include a special drug exhibit kept in remembrance of the store's earlier history, period rooms including a lumberman's business office, a life-size log cabin replica, a dentist's office, a Victorian dining room, parlor, bedroom, and kitchen. Also on display is an extensive collection of Victorian antiques and photographs. This park on Portage Lake is popular for fishing, swimming and special events, such as Concerts in the Park, Onekama Days, Fall Festival, and Winterfest. Families enjoy the park for parties and reunions. Celebrate and remember Ludington's rich maritime history at the Port of Ludington Maritime Museum, where visitors will be entertained and enlightened with interactive exhibits and virtual experiences. Located within a former US Coast Guard Station, the museum is a landmark on the National Register of Historic Places and opened in 2017. A wooded park with plenty of shade trees, it features a children's playground and a volleyball court. Home to the Manistee Saints, a local semi-professional baseball team. Located in this park are a children's playground, wooded picnic area, and a basketball court.